Lagundi – Scientific name: Vitex negundo L.
Lagundi is a common medicine shrub in the Philippines, and is found on Mt. Banahaw. 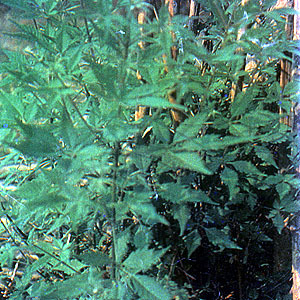 The use of Lagundi for medicinal purposes has a long history in the Philippines. Today, pharmaceutical companies sell it in capsule form at drug stores. The root is reported to be tonic, febrifuge, and expectorant. The root is also used in a great variety of diseases: dyspepsia, colic, rheumatism, worms, boils, and leprosy. The flowers are used in diarrhea, cholera, fever, and diseases of the liver, and are also recommended as a cardiac tonic. The seeds make a cooling medicine for skin diseases and leprosy, and for inflammation of the mouth. The leaves are reported to be used for coughs and asthma. This entry was posted in List of Medicinal Plants in the Philippines and tagged lagundi on March 20, 2009 by Pinoy Herbs. yes, lagundi is great for cough… you might just wait for awhile before you can experience the effect.